I have never been to Iowa! When I think about Iowa I think about CORN, sprawling corn fields and farm lands. I think about the phase "corn fed American man" and think that ya know maybe they are all from Iowa. I imagine that when I finally do get to Iowa I'll just run through corn fields with a corn on the cob in my mouth and climb bales of hay and drink a lot of beer. I did a little research on this state and found out some pretty dope facts. Iowa is the only state that starts with two vowels and is the only state who's east and west borders are 100% formed by water from the Missouri and Misissipi rivers. Also the capital Des Moines, that fancy name translates to "River of the Monks". Which is pretty epic! Iowa is also home to Quaker Oats which is based in Cedar Rapids and its the largest cereal company in the world! 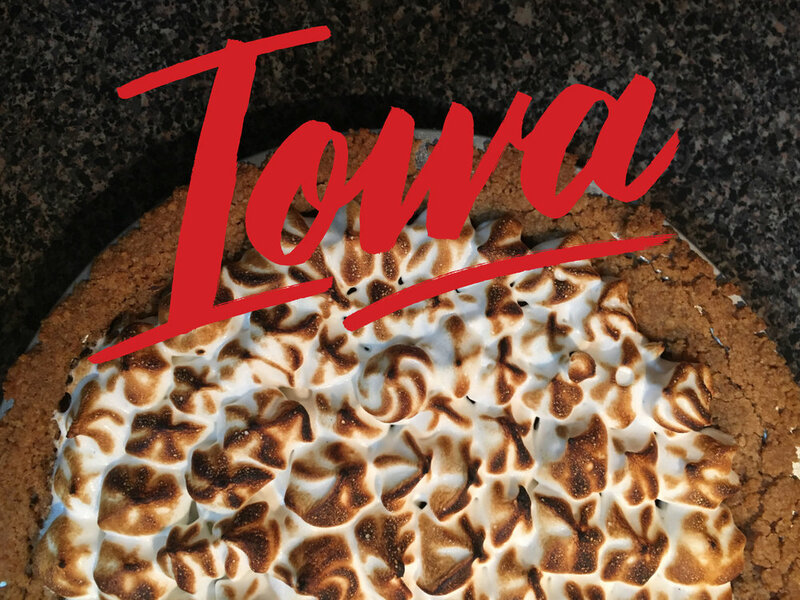 The state snack of Iowa is s'mores so I decided to make a s'mores pie! It's a homemade graham cracker crust, chocolate fudge filling with a home made toasted marshmallow topper. I only know one person from Iowa. That person is Patrick Gannon. Patrick Gannon is one of those dudes where you have to say his first and last name together when referencing him always. He is a corn fed American man. I met Patrick Gannon in Savannah,GA both of us went to SCAD and both of us liked to drink. So we got along famously. Patrick Gannon also told me once that in his family's barn in Iowa he put cat food on his body and let a bunch of kittens eat food off him. That's was a pretty weird but the story stuck with me. Patrick Gannon loves cats. So this pie is dedicated to my weird buddy. This pie is being received by Saranden Seip! Saranden is marrying her love Rick in Iowa later this year! She is the mom of a sweet pup named Stevie Licks and is the older sister of my old intern and lovely friend Sierra Seip who got the Arizona pie! We are keeping it in the family! This pie was Sierra and my wedding present to the happy couple! Iowa thank you for your Life Changing; Fields of Opportunity in both in a literal and physical sense! On to the two "K" states!